The first known prehistoric human from Taiwan has been identified and may represent an entirely new species that lived as recently as 10,000 years ago, according to a new study. The newly discovered big-toothed human, "Penghu 1," strengthens the growing body of evidence that Homo sapiens was not the only species from our genus living in Europe and Asia between 200,000 and 10,000 years ago. Anthropologists have learned that Neanderthals, Denisovans and Homo floresiensis (a.k.a. the "Hobbit Human") lived in Europe and Asia within that time frame. Penghu 1, which is described in the latest issue of Nature Communications, adds to that already impressive list and might have co-existed — and even interbred — with our species. "The available evidence at least does not exclude the possibility that they survived until the appearance of Homo sapiens in the region, and it is tempting to speculate about their possible contact," co-author Yousuke Kaifu, who is an associate professor in the Department of Biological Sciences at the University of Tokyo, told Discovery News. Kaifu, lead author Chun-Hsiang Chang, and their team studied the remains of the new human, which is represented by a jawbone with big teeth still in it. Chang explained that fishermen dredged up the jawbone off the coast of Taiwan in Penghu Channel. The fishermen sold it to a local antique shop, where collector Kun-Yu Tsai purchased it. Tsai donated his collection to the National Museum of Natural Science in Taiwan, where Chang works in the Department of Geology. Chang and his team recognized the importance of Penghu 1, which they theorize could represent a new human species or a regional group of Homo erectus, a.k.a. "Upright Man." "Penghu 1 is a national treasure in Taiwan and is well preserved at my museum with high security," Chang said. He and his colleagues believe that, due to its size, the jawbone came from an adult individual and possibly a senior, "because its teeth are worn severely," Chang said. 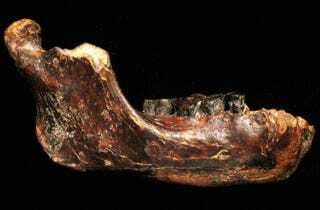 The jawbone's size further reveals that Penghu 1 was not a dwarf, unlike tiny Homo floresiensis, which lived on the island of Flores, Indonesia, where other animals were also smaller than usual. Penghu 1 instead lived on what was then mainland Asia in an ecosystem that included many other animals. "The associated faunal remains suggest that the area was a relatively open, wet woodland," Kaifu said. "This is because of the presence of large-bodied mammals, such as elephants (Stegodon), horses and bears, but the fauna also included animals that prefer marshlands in a hot and humid climate, such as water buffaloes." With such natural resources, it's not hard to imagine why archaic humans were attracted to the site. While Penghu 1's precise identity remains a mystery for now, one thing is for certain: this big-toothed human was not a member of our species. "This jaw is clearly not from a modern human and the proposal that it may belong to an ancestor related to, or a descendant of, Homo erectus is a reasonable one," Bernard Wood of George Washington University's Center for the Advanced Study of Human Paleobiology, told Discovery News. Wood continued, "We know precious little about human evolution in China and Southeast Asia at this time, so the possibility that more fossil evidence may come from the seabed in the Penghu Channel is an exciting prospect." Chris Stringer of the Natural History Museum noted Penghu 1's "short and wide" jawbone with its "large teeth" all raise "interesting questions about its classification." Stringer said that in some ways it is more primitive looking than the well-known "Peking Man" remains from Zhoukoudian, China, yet it also has certain features in common with the archaic human Homo heidelbergensis, as well as Homo erectus and even Denisovans. "This enigmatic fossil is difficult to classify," Stringer said, "but it highlights the growing and not unexpected evidence of human diversity in the Far East, with the apparent coexistence of different lineages in the region prior to, and perhaps even contemporary with, the arrival of modern humans some 55,000 years ago."